11:17pm – I’m going to leave the results there for the night. A wrap-up of the South Australian results will be up shortly, including some analysis of the key races and the Legislative Council, where it appears that the three incumbent crossbench MLCs have held their seats, with an outside chance for the Shooters and Fishers. I’ll be back tomorrow with more analysis. Until then, I leave you with this map of the new South Australian electoral map. Results of the 2014 election in Adelaide. 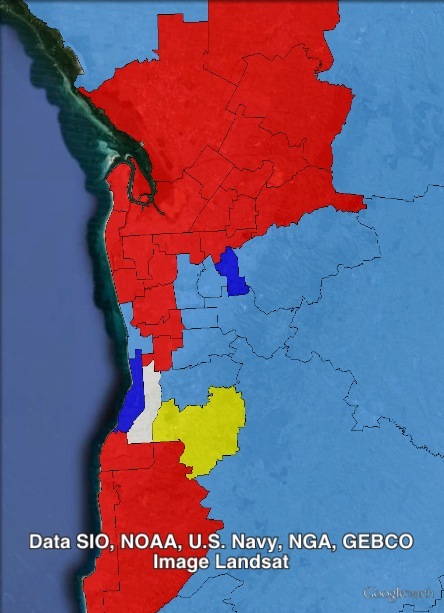 Labor seats in red, Liberal seats in blue, independent seats in yellow, undecided seats in white. Seats won by the Liberal Party off the ALP in dark blue. 10:31pm – We’re getting an increasing amount of votes being counted in the Legislative Council, and the Greens vote has been climbing. Mark Parnell was previously switching between winning the final seat and missing out, but is now winning the ninth seat. That’s on almost 45% of the vote. 10:24pm – At 10:30 I’ll be posting my summary of the results from Tasmania. From then on this post will only deal with South Australia. In short, two seats in Tasmania remain up for grabs, and the Liberal Party holds 14 seats. 10:15pm – We’re starting to see substantive figures from South Australia’s Legislative Council. With 30% counted, Antony Green’s Senate calculator is predicting 4 Liberals, 4 Labor, 1 Family First, 1 Shooter and John Darley of the Xenophon team. There’s a very close race between the fourth Labor candidate and the lead candidates for the Greens and the Shooters and Fishers for the final two seats. 10:00pm – On my latest figures, the ALP has 23 seats in South Australia. The Liberals have 21, and there are two independents. In Mitchell, the race is extremely close. If Labor wins, they will form majority government. If the Liberal Party wins, they will need both independents to form government. 9:37pm – I’m off writing up the results wrap for Tasmania, but just quickly on South Australia: Labor is now leading in 24 seats, which would give them a majority. ALP – 20, leading in three more. So if those six close seats split in that way, there will be a hung parliament. 8:44pm – The Greens vote in Braddon has fallen below the PUP vote, while the Labor vote has climbed to 1.4 quotas. The final Braddon seat is now a four-way race between a fourth Liberal, a second Labor, Greens or PUP. One of the two seats with no results is Stuart, which will be a safe Liberal seat. There’s a serious prospect of a hung parliament at this point. 8:13pm – Labor minister Grace Portolesi has lost her Adelaide seat of Hartley. 7:52pm – In Denison, the ALP has dropped back and the Greens have climbed, and it seems there is still a prospect of a second Green to win. 7:45pm – The ABC has projected that the ALP has lost its bid to gain back Adelaide, it’s best prospect of a gain in South Australia, despite Labor gaining a swing towards them. 7:38pm – We have almost one third of the vote in Lyons, and the Liberal Party has won a third seat. It looks likely that the Greens’ Tim Morris will win, but it’s still possible that the ALP’s David Llewellyn could win his seat back. 7:36pm – In Franklin, 12% has reported and the Liberal Party is over three quotas, and the Greens have a quota. With Lara Giddings not far short of a quota in her own right, David O’Byrne is left with only 0.4 quota, and is likely to lose his seat. 7:33pm – In Braddon, by contrast, over 15% of the vote is in and the Liberal Party are in the best position to win the last seat, which would give them four seats. The Liberal Party is on 3.7 quotas, compared to 0.54 for the Greens. 7:30pm – 16.5% of the vote has reported from Bass, and the prospects of a fourth Liberal seat have faded, with the Liberal vote down to 3.5 quotas, and the Greens vote over 0.8 quotas. 7:29pm – The Labor vote is rising in Denison and has almost reached two quotas, and thus the chances of the Greens to win two in Denison, and to overtake Labor, are almost dead. 7:20pm – Let’s take a look at South Australia. There is a swing to the Liberal Party and away from the ALP, but by much less than in Tasmania. Remember that these numbers are likely to shift against the Liberal Party. 7:10pm – My standard disclaimer of ‘it’s far too early’ applies, but in Franklin, Premier Lara Giddings is just ahead of David O’Byrne, and it’s certainly a possibility that Labor will only have enough votes to elect one MP. Worth watching. 7:08pm – Looking at the Tasmanian results, it appears the Liberal Party is in a very strong position to win, and could win as many as 17 seats. 6:53pm – Unfortunately the Tasmanian Electoral Commission doesn’t provide booth-level results on its website so we’re relying on the ABC to know how representative our sample is. The TEC does provide a media feed, but refused to provide it when I asked a few weeks ago. Apparently it’s only for ‘accredited media’. 6:46pm – Antony Green suggests that Braddon’s result, while favouring the Liberal Party so far, should result in the Liberal Party staying about 50% and thus winning three seats. That will be the first Liberal gain, of three needed. 6:43pm – We have small figures for Lyons and Braddon, and in both places the Liberal Party are well over three quotas, but these numbers are still small. 6:39pm – So far, a tiny proportion of the vote has been counted in Tasmania, and Labor’s vote is down by 15% and the Liberal vote up by almost 12%. The Greens vote is down by about 6%. Far too early to make assumptions. 6:30pm AEDT – Polls have just closed in South Australia, and closed half an hour ago in Tasmania. I’ll be staying with you throughout the night covering election results in both states, as we expect to see ageing Labor governments lose to Liberal oppositions. I’ll be posting updates timestamped with Australian Eastern Daylight Time, which is the timezone where I reside, and the timezone in Tasmania. Sorry South Australians. Stick with us and we should have the first results soon. The SA Libs have some serious problems with the voters in the last two elections. Marshall did not look like a leader to me from what I saw on TV. They probably should have given the Michelle Redman (think that is her name) a second go after the narrow loss last time. Tasmania produced a majority government in a Senate-style system where majority government was said to be difficult, but South Australia produced a hung parliament – what a delicious irony! And I’m certainly shocked to see that Xenophon’s “man” Darley might get in, simply because Xenophon hasn’t exactly managed to get his “people” in at elections when he doesn’t run. Mr. Jackson, the last leader of the SA Liberals was Isobel Redmond, who is still the member for Heysen. Maybe she could do a Howard and come back to the leadership? Thanks Anton and you could be right. I’m similar to you, Anton. I tipped Labor to hold Mawson, but I expected the other seats that you mention to go to the Liberals. More than a few SA Liberal powerbrokers will be wondering what the hell went wrong!